Built in the 1950s as a filling station along the main road, today’s State Highway 522, and added to in the 70s, it’s been the Chamber of Commerce, a coffee shop, a thrift store, an artist’s studio, a day care, and a home. 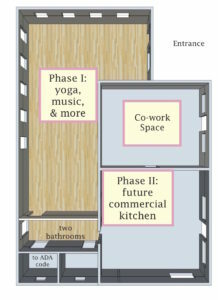 Renovation is underway (see progress below) to make a space for yoga, music events and expressive arts, and other community uses. 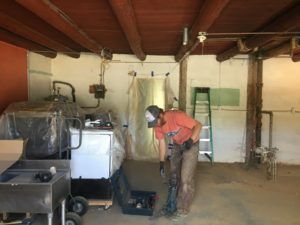 The smallest room, updated in April 2018 with energy efficient lighting and a few other touches, will soon be used by collaborating non-profit projects, LEAP and Questa Farmers Market, programs of Localogy, to hold meetings, and share a Co-work space. In this way, La Sala is a creativity multiplier; a space for cross-pollination and supporting greater community work. We don’t know when Phase I will be complete. 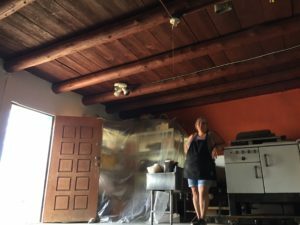 Eventually, Yoga Sala, currently operating at beautiful OCHO, a massage and healing space in Questa, will move in. Stay tuned for our Kickstarter campaign. We’ll lay it all out for you. 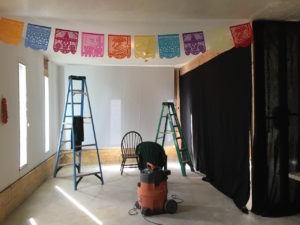 Although we’ve begun to amass some commercial kitchen equipment, this phase of renovation happens next, after the yoga-movement-music space is functional. 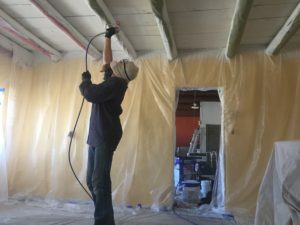 However, the groundwork is being laid, which included removing a dirt roof and laying new insulation over the future kitchen room and the co-work space. 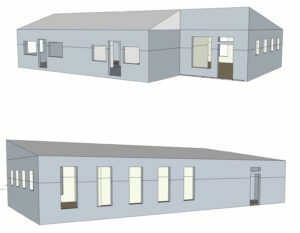 Building acquired February 26, 2018. 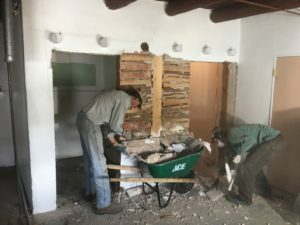 March to mid-April 2018: Renovation in one of the small rooms – making a space for music and a resident Yamaha grand piano before the big yoga-music-movement room is completed. September 1, 2018: Inaugural cello, violin, and piano concert was held with a full house in attendance. 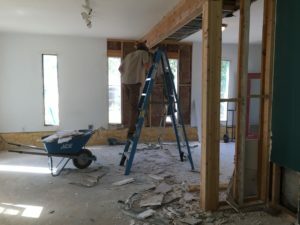 September 3, 2018: Careful demolition. Old, tiny rooms (formerly the gas station bathrooms, converted into closets) were removed to make room for new heating system ~ an efficient boiler system that will feed wall radiators. And, now, more room for the future commercial kitchen . 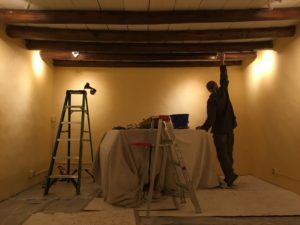 . .
September 29, 2018: Opening up the yoga/movement/music space to make more room! Support beam will be shifted about 4′ west (to its former location) to open up the floor plan. October 30, 2018: Making a theater-for-a-night to show “Coco,” (animated Disney/Pixar film focused on Day of the Dead). 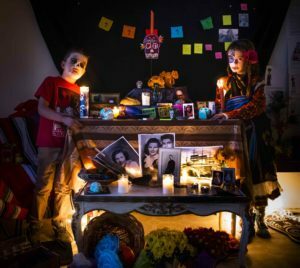 November 2, 2018: Dia de los Muertos ~ Day of the Dead, our community celebration! More . .
January 2019: New windows and relocating a support beam.